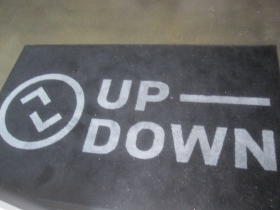 Up-Down Milwaukee. Photo by Michael Horne. 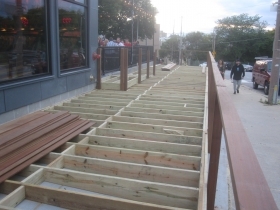 A new stand-alone Milwaukee tavern building? That’s rare. 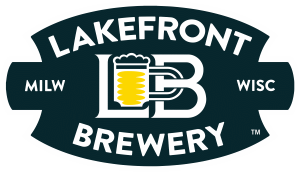 In 1900 breweries built new taverns by the dozens throughout the city, many of which are still in business, as readers of this column know. Sure, many new hotels, restaurants, mixed-used buildings and clubs have opened in the intervening century-plus. But few new purpose-built saloons have been constructed since the onset of Prohibition 99 years ago. So welcome to Up-Down Milwaukee, 615 E. Brady St., a newly built “arcade bar.” It is the fourth outlet of an Iowa-based chain, joining the flagship bar in Des Moines (2013), and others in Minneapolis (2016) and Kansas City Missouri (2015). 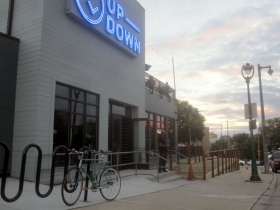 The two-story building has two floors of outdoor decks, a rotating selection of more than 60 arcade games from the 1980s and 1990s, three skee-ball alleys and a Nintendo 64 gaming console. 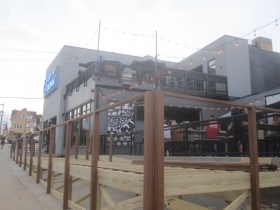 The tavern is designed to appeal to a younger demographic for whom such late-20th century pastimes evoke a sense of nostalgia. Missing is a pool table, that staple of Milwaukee taverns. A pool table generates much less revenue than an old video game and takes up much more space. With the construction of the Holton Viaduct in 1925, and the popularization of the automobile around that time, the property was ideally suited as a location for a gas station, as was the one to the east, a superior location with better bridge visibility and access on N. Van Buren St. as well Brady St. That gas station, at 1683 N. Van Buren St. eventually became Giovanni’s Restaurant. We’ll get there later. We do know that in November, 1932, Jack Spinelli, operator of the station on this site, spent $2,000 hiring himself as a general contractor to “Repair Fire Damage and remove and replace wall between office and garage. Replace sash and channel with 6″ I beam. Repair damage to plaster, roof doors, etc.” In 1937 the building was owned by the Albert Trostel Tanning Co., and was 15-foot by 18-foot, with Oscar Detert operating it. Jack Spinelli was back in 1948 when a 13-foot by 8-foot addition was put on to the place. The station remained in business until around 1962, with a painted sign on a cinderblock wall visible to Holton Viaduct drivers advertising Pate Air Glide Gasoline, Milwaukee’s biggest seller at the time. In 1965 the gas station was gone, and Gerhard Ruediger took out a permit to occupy the place as a coin-operated drycleaner. “Mr. Ruediger familiar with requirements. Has operated coin-op at 1693 N. Van Buren,” wrote the license clerk. Ruediger hauled his four machines from his former location (next door) and also moved the sign advertising “Queensway Coin Operated Dry Cleaners – 10 lb. load $2. – 18 Min.” At some point Ruediger, who owned the building, shut down his hazardous business and leased it in 1979 to John Kmiecik for the wholesale and retail sales of used tires and re-caps. “No re-capping on premises.” By that time Giovanni’s Restaurant next door had been open since 1972, operated by recent Sicilian immigrants Giovanni Safina and his wife Rosa Safina, in a former Frank Balistrieri-owned gas station at 1683 N. Van Buren St. In 1982 the couple also opened a restaurant in this old gas station, dry cleaner and used tire shop. They spent $7,000 to get Villa Rosa Pizza running, and another $45,000 to expand it a year later. The permit application was issued to “John Giovanni,” an amusing clerical error. In 1989 the Safinas changed format, opening the Comedy Cafe. It was listed on the application as “Entertainment Center. Comedy Club. Food – Drinks will be served. Professional Comedians performing.” Giovanni’s closed in 2006, and the Comedy Cafe shut the doors on the Brady Street location in 2015. After two years of vacancy, the building was bought by the current operators in November, 2017 for $725,000. Demolition work in January, 2017 preparatory to the construction of the current structure briefly revealed a ghost sign advertising Pate Air-Glide gasoline. 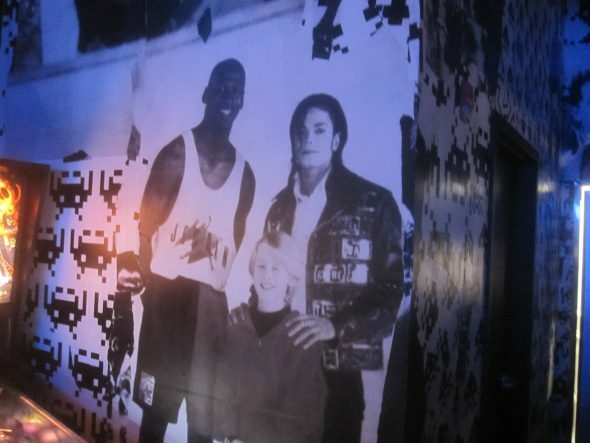 Photograph of Michael Jordan, Michael Jackson and Macaulay Culkin. Photo by Michael Horne. Today, the new tavern, at its busy and complicated intersection, resembles for the first time a destination that was not once a gas station. Garage doors open up to the street, and two levels of outdoor terraces embrace the views (for now) across the river, as well as of the activity of Brady St. The glassy front is welcoming — much more so than its predecessor, which was walled off and secretive. The first thing to greet the visitor is a token machine (“Cash Only”). You take your tokens, and head to the dozens of machines scattered throughout the place. 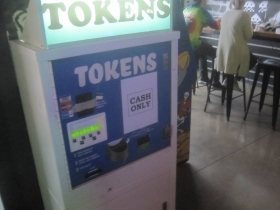 If you’re lucky, you will find a spot that is not occupied, so that you can begin play, lest you go home with your cash in the machine, and the otherwise useless tokens in your pocket. Period-appropriate music plays at a rather loud level, but is nowhere near as annoying as the weird thrum, the mind-trance sounds of a casino, designed to lull and manipulate players. Here, it is all for fun. You get nothing out of your tokens save the joy of spending them. The walls are papered in riotous colors with posters of the Twilight Zone and a Tetris advertisement along with Up-Down logos and other visual onslaughts. A big “MILWAUKEE” sign is on a wall outside the Skeeball court. Adding a nostalgic touch suited to the era, is a larger-than-life wall-sized photograph of Michael Jordan and Michael Jackson, the latter with his hands on the shoulders of a young Macaulay Culkin. A few deals are offered, such as 16 oz. tallboys at $4.50 each, or 2 for $8, for those with long-term plans and a wish to maximize dollar value. Check the specials on the website for many opportunities for other specials, including discount (or free!) tokens. The two-level floor plan is open, with a staircase on the west end of the floor. All is neat, and new. It is worth looking up at the ceiling, since the building is constructed very much along the lines of the late 19th century warehouses of the Third Ward, with steel columns and brackets supporting a wooden structure. The terraces, both lower and upper, work seamlessly with the floor plan, and will be sorely missed during the upcoming winter. But even so, the views will be great through the ample windows. The bar itself is located in the center of the first floor, with another bar above. There are 59 beers on tap, a staggering number, and they are dispensed from a novel three-tiered wall of tappers, visible from two sides. Television screens surmount the bar for those not in the gaming spirit. Those at the bar with an itch to participate in the blood Milwaukee sport of bar dice will be disappointed, as will the pool and dart players. But this is no concern to the audience here, where nearly every machine was busy on an evening shortly after opening. Outside, a pickup truck arrived with yet another machine for the place. Whoever has old gaming machines for sale will be happy to find that the Up-Down folks have provided a new and likely steady market for these old relics. A “Now Hiring” sign lists a number of openings for bartenders, servers, door security, pizza cooks, bar backs — and significantly — game techs. 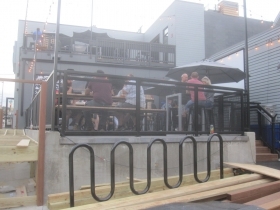 Bike Racks: Yes. one at front door, another at west side of building near ramp.